I am mixed. Born in 1983, I have lived in a small town of roughly 1000 as well as the largest city in Canada. I have visited both coasts, a variety of towns both east and west. And yet, while inhabiting the same body, I have been identified by others as anything from Southern European, to East Indian, to North African, and back again. When I’m with a group of people, that adds a new dynamic and a new set of interpretations. This part I actually don’t mind. It’s when I finally answer the common questions “Where are you from” or “What are you”, the wide variety of reactions are what I do mind. Negative responses that range from disbelief, anger, laughter, or disappointment are one thing; but even the positive, post-racial style responses like “people like you will solve racism” and “mixed people are so exotic”, despite the good intentions, are equally alienating. Growing up I didn't fully understand why these comments gnawed away at me, as I didn’t have the language to truly grasp what was happening. I later learned that they were in fact microaggressions, which explained why I found them to be so isolating and painful. This pressure moved me to learn everything I could about the mixed-race experience in Canada. While on that journey, I imagined that others may be feeling the way I was and created the site “Mixed in Canada” (www.mixed-me.ca), to serve as a virtual home-base of sorts. 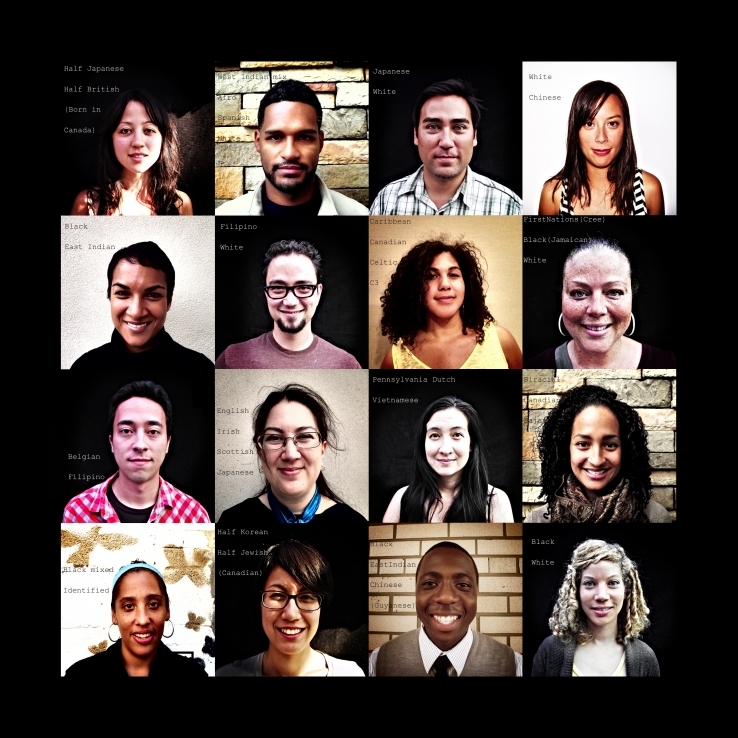 From this effort, a photo project ensued, documenting mixed-race faces from different parts of Canada. This project has deeply impacted my sense of self and has provided me with a wonderful, new, patch-work family across the country. For this reason, it was my intention to make a photo-quilt of these generous faces, with the hopes of broadening the horizon of what both “Canadian” and “mixed” looks like. The fact is, Canada has been home to a variety of mixed-race people for centuries, but it seems as though something is changing. More and more mixed-race people are rejecting the labels that come with the territory: half-breed, mulatto, mutt. We are beginning to explore the boundaries of self-identification, trying them on for size, or even stripping ourselves of them completely. I am both humbled and honoured to know that I am following in the footsteps of those that came before me, as well as laying down new ones for those behind me. While I continue to navigate my own path, what I have discovered is that the thing I once thought of as my greatest weakness, has now become my greatest strength.